Because garlic requires a cold period to properly produce, garlic cloves should be planted six to eight weeks before the ground is expected to freeze. This will give the cloves time to produce roots and to begin growing shoots before the ground freezes, as well as providing them with their chilling requirement during the winter. Growth will resume come spring. Garlic can be planted in the spring; however, if this is done the cloves should be stored in a refrigerator for at least eight weeks prior to planting. This will ensure they have been properly chilled. While you can get good yields from spring planted garlic they tend to not yield as reliably as fall planted garlic. There are two main types of garlic; softneck and hardneck. 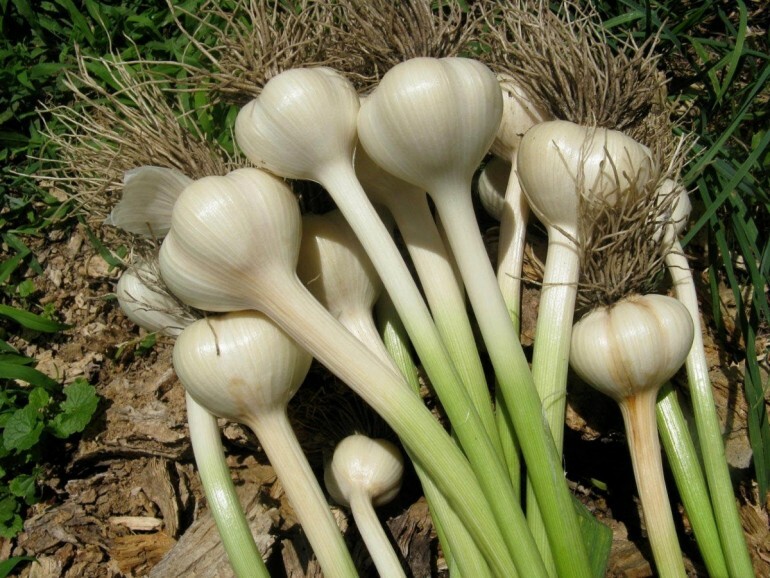 Hardneck garlic produces a hard stalk called a scape, which is where the name hardneck comes from. It is easy to peel but it does not store well. On the other hand softneck garlic stores well, which is why we typically find it in grocery stores, but it does not peel as easily. Softneck garlic also rarely produces a flower stalk, thus the softneck name. Garlic should be planted in well-drained soil in full sun. Garlic does best in soils with an abundance of organic matter. Therefore, make sure to amend soils with compost or well-rotted organic matter. In addition to adding organic matter apply two to three pounds of 10-10-10 fertilizer per 100 square feet before planting. It is best to get your garlic from garden centers or catalogs. Garlic sold in grocery stores is usually treated to prevent it from sprouting, so it’s not a good choice for planting. Some hardneck varieties that do well in Illinois are Spanish Roja, Carpathian, Georgian Crystal, Music, Metechi, and Persian Star. Softneck varieties Inchelium Red and Idaho Silverskin do well in Illinois. Once you have your garlic bulbs they should be broken apart into individual cloves. Don’t divide your bulbs until right before planting. Choose the largest cloves for planting, making sure to discard cloves that are diseased, small, soft or otherwise damaged, to get the best yields. Once the soil has been prepared and you have selected you cloves, plant them one to two inches deep and four to five inches apart with 15 to 18 inches between rows. Make sure to plant the cloves with the pointed side facing up. Garlic is susceptible to the same pests and diseases that onions are, such as thrips, onion maggots and bulb rots. Garlic is also a poor competitor. Therefore weed control is critical to a successful garlic harvest. A four to six inch layer of weed-free straw or other organic mulch can be added to help control weeds and it will also help moderate soil temperatures. If growing a hardneck variety, the scape should be removed just after it uncoils. If the flower stalk is not removed your yield can be reduced by 25 percent or more. Garlic should be harvested when half of the leaves have turned yellow. Bulbs should be cured in a cool, dry, well ventilated area for several weeks. Once your garlic is cured, the stems and roots can be cut off and bulbs cleaned by removing the outer most skin, making sure not to expose the cloves. Finally they should be stored in a cool, dry, dark place and you can enjoy the fruit of your labor.